To qualify for the 85% shared ride discount you must provide proof of age documents and complete the MT-103 Form. This form is available directly from ATA. Without a properly completed and certified MT-103 on file at ATA the 85% discount can not be offered to eligible passengers. To be eligible for the 85% discount, a senior citizen must register with the ATA by presenting one of 11 acceptable age verification documents which, based on the birth date, proves that the applicant is at least 65 years of age. To be eligible, a person must be a Pennsylvania resident, at least 65 years of age, and provide a completed application form to ATA. The form is calle d the MT-103 which is the formal record of your eligibility for the discounted service. ATA’s Shared-Ride Program for Senior Citizens enables persons 65 years of age and older to use shared-ride, demand-responsive services and pay only a small portion of the regular shared-ride fare. To participate in the program, the individual must be registered with ATA. All rides must be requested at least one working day prior to the scheduled pickup time to qualify for the discount. Remember, any subsequent change in your ride reservation may result in a full fare trip. If you live in a served area of Cameron, Clearfield, Elk, Jefferson, McKean or Potter counties, ATA will pick you up at your home (or another location of your choice) and take you to your destination. Later, ATA will pick you up at a scheduled time for the return trip to your home. For information on specific service areas and schedules visit the ATA website at RideATA.com or contact the ATA’s Customer Service Department 1.866.282.4968. Shared-ride trips are scheduled based on demand and the availability of resources. ATA fits all trip requests into a schedule that varies day to day. Some vehicles fill up quickly. Make reservations as soon as possible or within two weeks prior to departure. While ATA makes every effort to meet the needs of its customers, there are limited resources and ATA may not be able to accommodate every request. ATA reserves the right to create and adjust schedules on an “as needed” basis; and to eliminate routes when an inadequate demand exists. Remain flexible in your plans to assure your place on the bus. The Pennsylvania Lottery Shared-Ride Program pays up to 85% or $42.50 whichever is less, of the regular fare. An approved third party sponsor, pays the remaining balance of the fare. The Shared-Ride discount is available during all general public transportation service hours offered by ATA. Regular fares for shared-ride services are at least $2.25 and go up from there depending on the service type and the distance traveled. These fares are heavily discounted. For instance, a regular fare of $2.25 would be discounted so that your portion could be 35 cents. Your portion of a fare of $3.50 could be 55 cents. ATA can provide you with specific fare information based upon the service needed and availability. The Area Transportation Authority of North Central Pennsylvania operates the Shared-Ride for Senior Citizens Program in Cameron, Clearfield, Elk, Jefferson, McKean and Potter counties. The Pennsylvania Lottery pays for an 85% discount on general public fares for eligible senior citizens age 65 and older who ride on ATA's non-fixed routes. Download the ATA MT-103 PDF form here. Complete and verify the ATA MT-103 Form. 1. 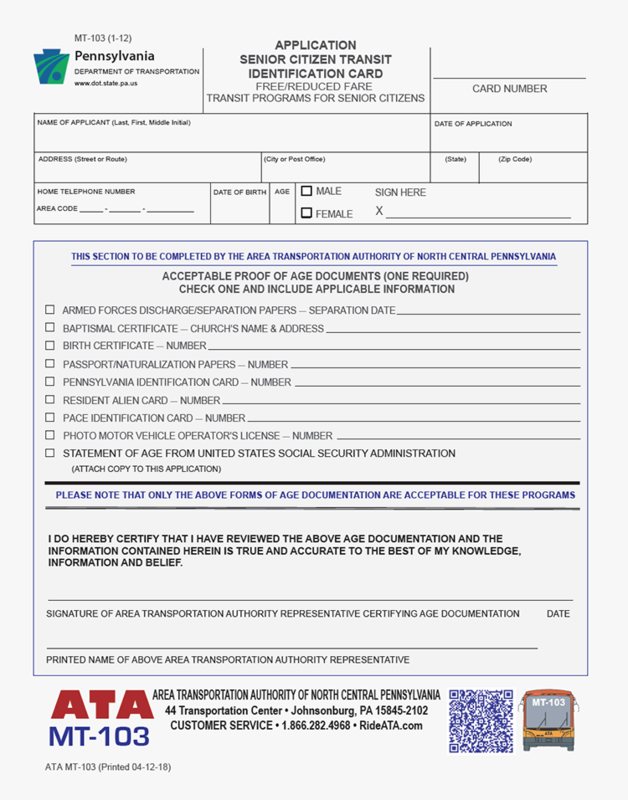 Request or DOWNLOAD the new ATA MT-103 Form in PDF format. Fill out the top section of the application completely. This is an interactive form so you can fill out your section of the MT-103 by typing from your computer. 2. Confirm Your Age. You must present one of the documents listed on the application to an ATA employee as age verification and sign the application in the employee's presence. The ATA employee will sign the back of the card to confirm the verification. 3. Return the MT-103. Mail the completed form with the ATA employee signature. Use the postage paid envelope to return your application to ATA Customer Service.